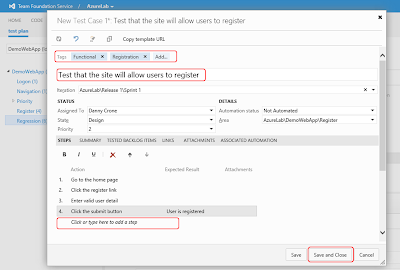 Just got back from the ALM Summit in Redmond and we watched Anutthara's talk about Agile testing, she demo'd some of the new Update 2 CTP 2 test features that Brian Harry announced a couple of days before and so I thought it might be good to put a walkthrough together for the new Web test case management features in TFS 2012 Update 2 CTP 2. 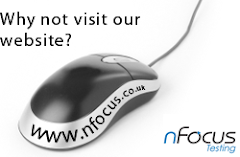 To start with, if you are using Team Foundation Service, you have had it enabled from 29th Feb, but if you are using an on-premise TFS then you will need to install Update 2 CTP 2 in order to enable the feature. 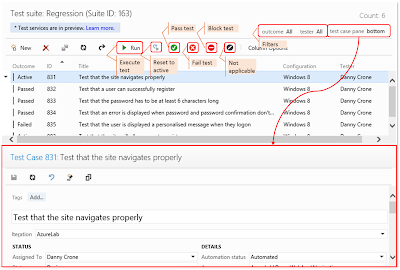 From here we can interact with Test Plans that have been set up using Microsoft Test Manager (MTM). 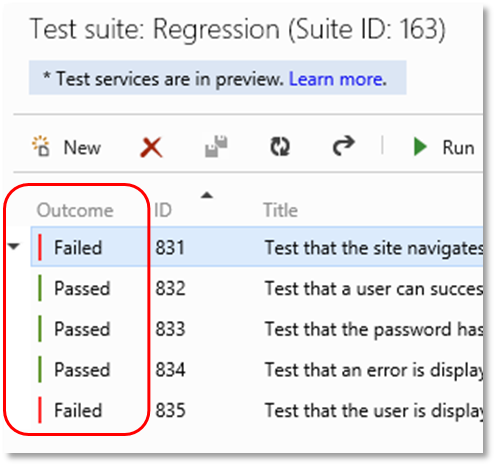 There are a number of things that you won’t be able to do like creating new test plans, creating test suites. 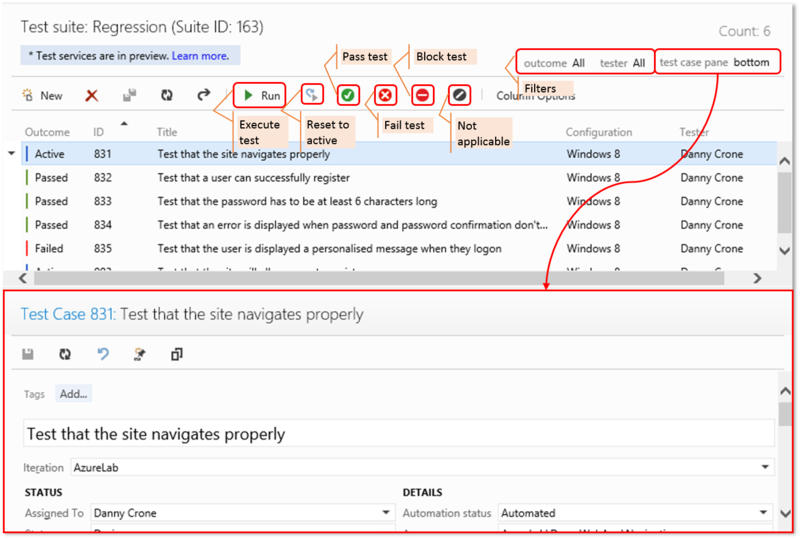 Test Plans and Test Suites are pretty easy to create in MTM, then you will be able create new test cases and execute those test cases, let’s take a look at the experience for creating new test cases. 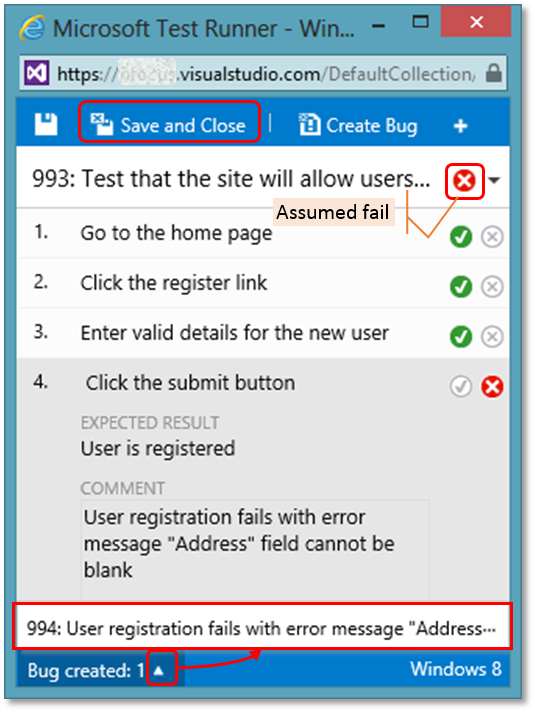 Once we click save the test case is created and brought to life in the test suite in the current test plan. 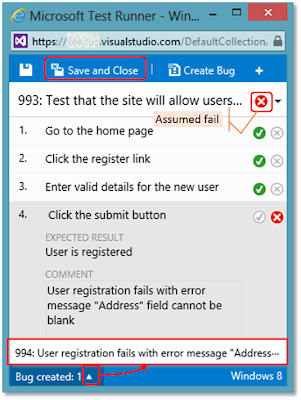 From here we can choose to Reset to Active/Pass/Fail/Block or make the test case “Not applicable” without having to execute each of the test steps, which is great if you are in a hurry, know the steps that need to be executed and just want to show progress. Also note the filters that are present top right, along with the ability to change whether the test case pane is displayed at the bottom, the right or invisible. If you want to execute the test case long hand, then that is covered too. All we have to do is select our test and click the “Run” button. 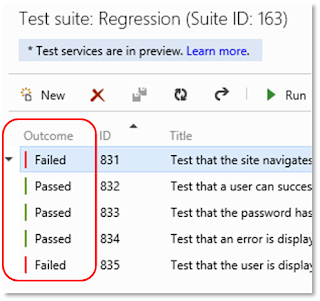 This brings up the Test Runner which docks to the left hand side of the window and displays all of the test steps for the selected test case. Using this test runner, we can click through each test step, performing the action, checking the expected result and passing or failing the test step. If we find a bug, we can chose to fail the test step, make a comment and click the “Create Bug” button. 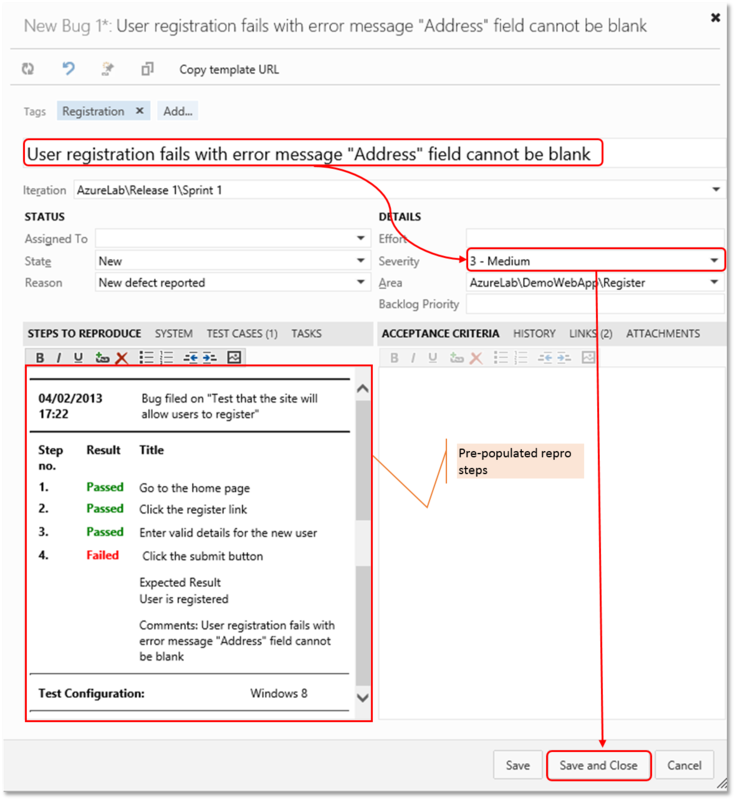 This will bring up the Bug form in a similar way to the test runner experience in MTM. 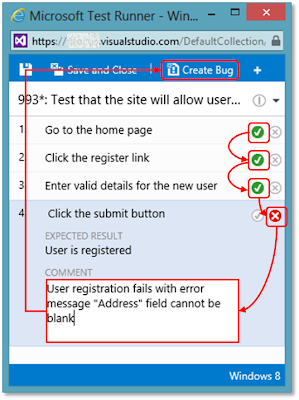 The new bug form is already populated with the information about the steps, what the user did, what was observed, what passed and where it failed. All that is left is to complete a title and perhaps a severity, hit save and close and we are done. We are back at the test runner and TFS has “filled in the blanks” and worked out that the test result is probably a failure. It is also possible to View a summary of the bugs that have been raised using the button at the bottom of the screen, the titles of the raised bugs appear in the resulting pop-up. To update TFS with the results, simply click the “Save and Close” button at the top of the Test Runner. 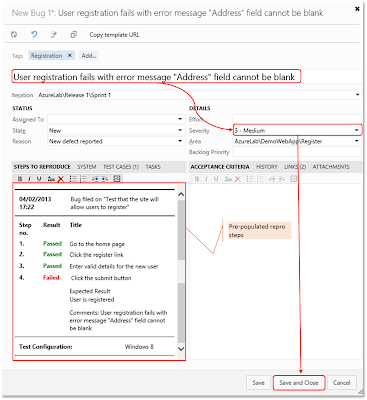 So to summarise, this new Web test case management feature of TFS allows us to plan, manage and execute upon our testing effort from a machine that does not have to have any client software installed. It may not provide all of the features that MTM can offer the tester but there is enough to make it powerful and agile at the same time.